My kid is entering first grade in the fall. I’m suddenly thinking about all the books I read to my class of first graders I supervised years ago. How can he possibly be the same age as them??? They were so big! Well, either way, like it or not, my kiddo is growing up. I don’t think I’m going to run out of books to read to him though! 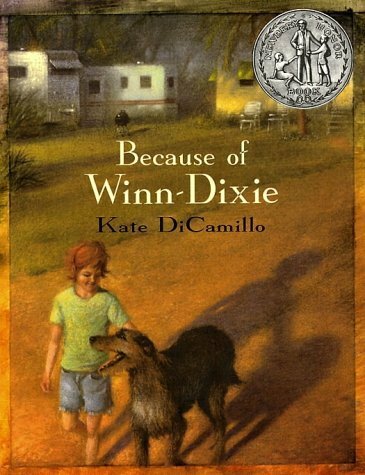 I read Because of Winn-Dixie to that class of precocious first-graders and they all loved it. So when I saw it on the shelf, I knew exactly what we’d be reading together. If you haven’t read it, Winn-Dixie is just a beautiful story, told in the charming first-person of a young girl named India Opal Buloni, preacher’s daughter and newest resident of Naomi, Florida. On an errand to pick up some groceries from the Winn-Dixie store, Opal encounters a stray dog who is terrorizing the produce department. She quickly claims him as her own and brings her new dog, Winn-Dixie, home to meet the preacher. Everything that happens that summer happens because of Winn-Dixie. If it wasn’t for him, she would never have met the kindly, nearly blind, old Gloria Dump. She would not have met Otis from the pet store whose music would hold all the animals in rapt attention. And if it weren’t for that old stray, her father might never have pulled his head out of his shell. Kate DiCamillo manages to write a book that is disarmingly sweet in its story and tone without ever coming across as saccharine or forced. It’s a wonderful book with blessedly short chapters. I recommend it to all. I don’t know about you, but I love forensic history shows. You know the ones: scientists carefully combing over some sort of historical site or remains with a brush and a pick trying to understand the truth behind what happened and, possibly, why. This one’s pretty darned compelling. The tomb of Richard III, hunchbacked king of England made eternal by William Shakespeare, was presumed destroyed and lost forever. But a team of cunning historians suspected that this otherwise unassuming parking lot in Leicester, England might hold some secrets beneath the pavement. Curiously, there was a big red “R” painted in one of the parking spots. Why not dig there first? Who knows? You’ll never guess what they found! They found a skeleton. AND this skeleton had a notable curvature of the spine. AND this skeleton had met a rather grisly end, most certainly on a Medieval battlefield. Take a look at a halberd and you’ll know that this is not the way anyone should expire. But guys, they found Richard III. Almost certainly. The reproduction of his facial features based off the skull are eerily similar to well-known portraits of the king. It’s a slightly melodramatized show, but it’s laden with real science and facts so you can enjoy it without feeling too guilty. 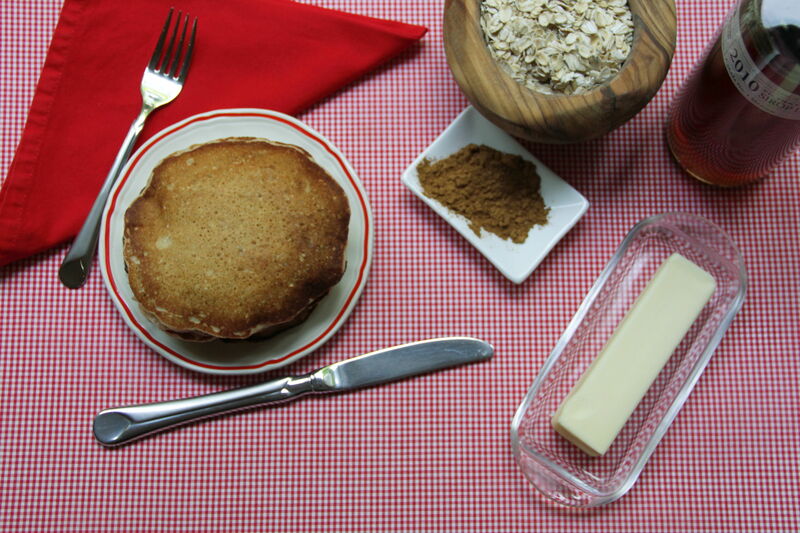 My niece refers to Oatmeal Pancakes as “two breakfasts in one” – a breakfast imbued with both the rich, buttery pleasures of pancakes and the creamy texture of old-fashioned oats. The tricks here are to cook the oats in advance, whip the egg whites to aerate and keep the batter light. A wisp of cinnamon feels just right. “Oatcakes” have a long-standing tradition inScotlandandIreland, where documentation of their existence dates back to the time of the Roman conquest in the year 43 CE. Oats grew well in the tough, rocky soil, and the nutritious grain could be mixed with water and cooked over a fire to make “bannocks” or “farls”. 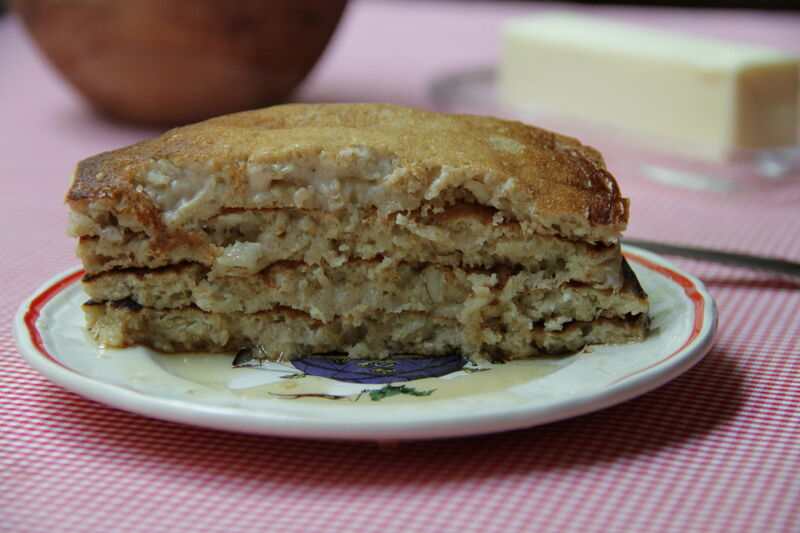 Be forewarned – Oatmeal Pancakes will fill you up. Try them before a hike, or a day when a late lunch is planned. For an even heartier pancake, add some chopped nuts, sliced bananas or tangy raisins. 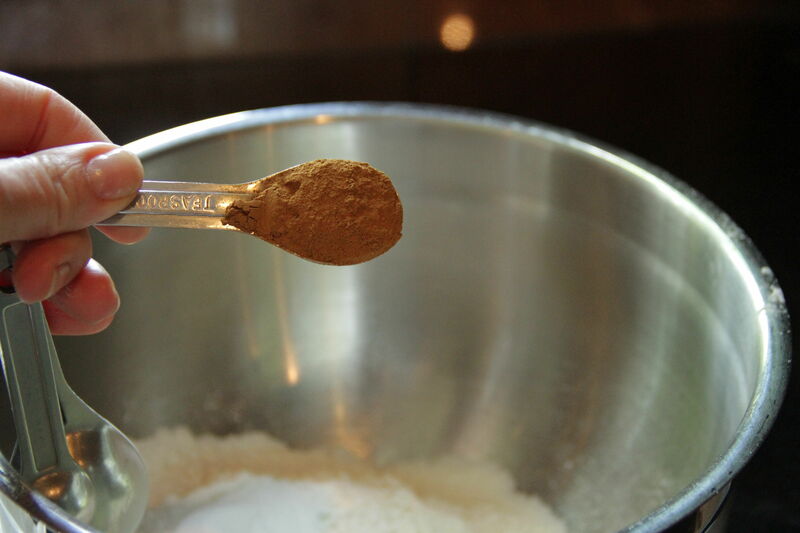 Combine flour, baking powder, cinnamon and salt in large bowl. In separate bowl, stir together cooked oatmeal, honey, milk, egg yolks and vanilla. 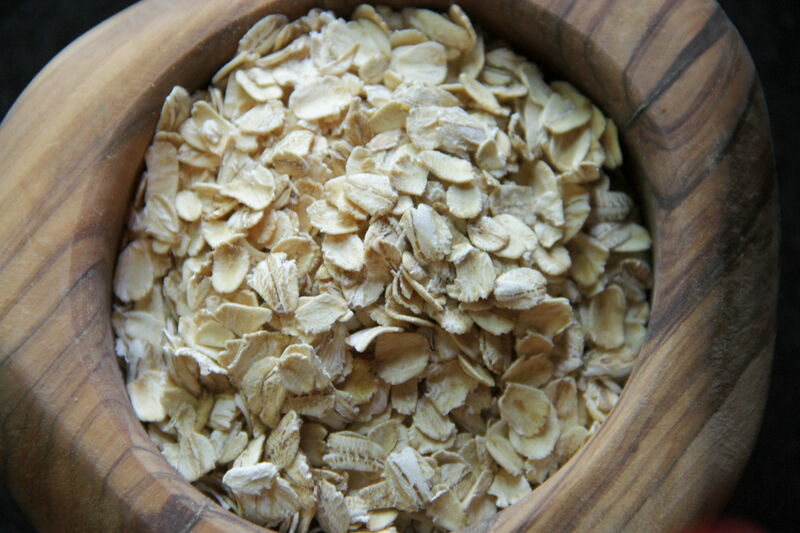 Gradually add oatmeal mixture to dry ingredients. Slowly add melted butter to batter. 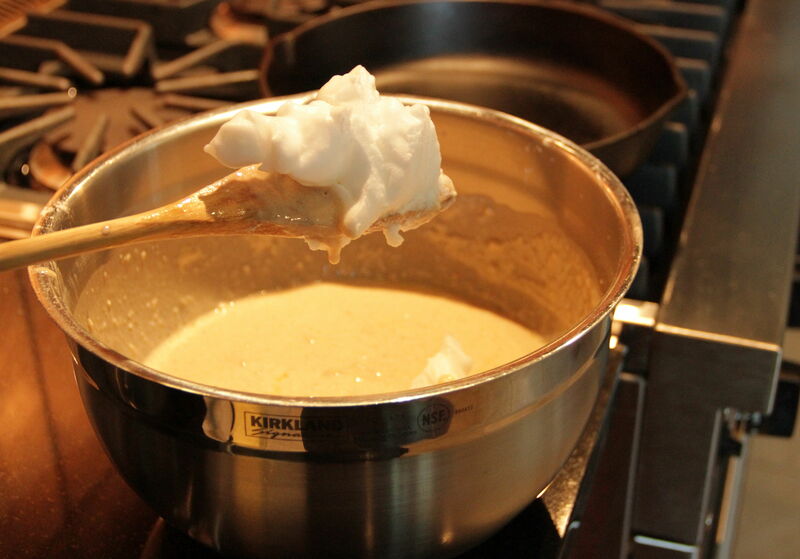 Beat egg whites until stiff peaks form and fold into batter. Place pan or griddle on burner over medium to medium high heat. Melt a small amount of butter in the pan for the first pancake. Ladle batter into pan and cook until small bubbles appear throughout pancake. Flip once with spatula and continue cooking until golden brown, one to two minutes, adding more butter and adjusting heat as necessary. Keep warm while making the remainder of pancakes. Serve hot with butter and real maple syrup. Makes 12 to 14 4-inch pancakes. 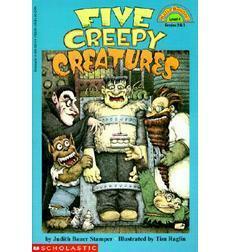 Five Creepy Creatures by Judith Bauer Stamper. Monday afternoons are such fun. I look forward to seeing my son’s picks from the school library almost as much as he looks forward to the big reveal. It’s become a big, built up event now. He loves to sneak it out of his bag and hold it behind his back until I’m ready to see experience the unveiling. I also love how totally unpredictable his choices are. Last week he brought this silly reader which features five not-so-spooky stories from the LAND OF THE UNDEAD! All of them end in ridiculous puns. (I am very proud of him for choosing a book filled with puns.) For example, in one story a boy and girl are followed out of the creepy graveyard by a coffin. The coffin follows them all the way home. The boy is terrified but the girl calmly pulls out a cough drop and gives it to the coffin. “That will stop this coffin [coughin]!” Yuk yuk. There are also a bunch of terrible knock-knock jokes. But really, are there any other kind? He read those to us about fifty times. They just get better with every reading! So if you have a kid who is just getting the hang of reading and likes creepy funny stories, this one is something s/he may enjoy. You might want to leave the room, however. EVERYTHING IS AWESOME! That’s pretty much the mantra in the deliriously happy LEGO world our hero Emmet lives in. What he doesn’t realize is that he is living in a totalitarian society ruled by the ruthless President/Lord Business. You must build all your sets according to the rules. Do not diverge from the rules. Why would you? Everything is awesome! Tacos on Tuesdays! But then one day, quite by accident, he finds himself immersed in a new world. After tumbling down a hole and becoming fused with a mysterious object, he becomes the prophesied “Special” whose job is to defeat Lord Business, who means to glue all pieces together. Emmet is hilariously not ready for this role. He’s a super happy-go-lucky guy who has never questioned anything ever. 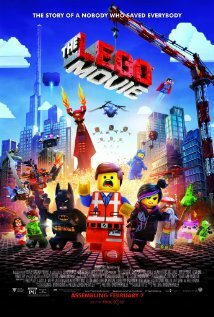 Filled with all your favorite LEGO minifigures from Batman (who is an egomaniac) to 80s space guy with the crack in his helmet that I remember so well from my own childhood, this movie is surprisingly entertaining and peppered with enough subtle jokes for the grown-ups to keep everyone happy. My favorite character is Unikitty, the happy unicorn/kitty hybrid whose repressed rage is just WAITING to be unleashed! And when it does, you’d better watch out! This movie just came out on DVD so pick up a copy and have an awesome night in with the family.